Mint Lounge’s New Year issue is based on a great premise: new experiences. Lots of great stories: adopting a stray, rainwater harvesting, grieving your parents, being a mentor, taking trips, finding yourself. Read it here. My contribution below and here. Thanks, Seiichi Chadha and Michi Travel for arranging this trip. 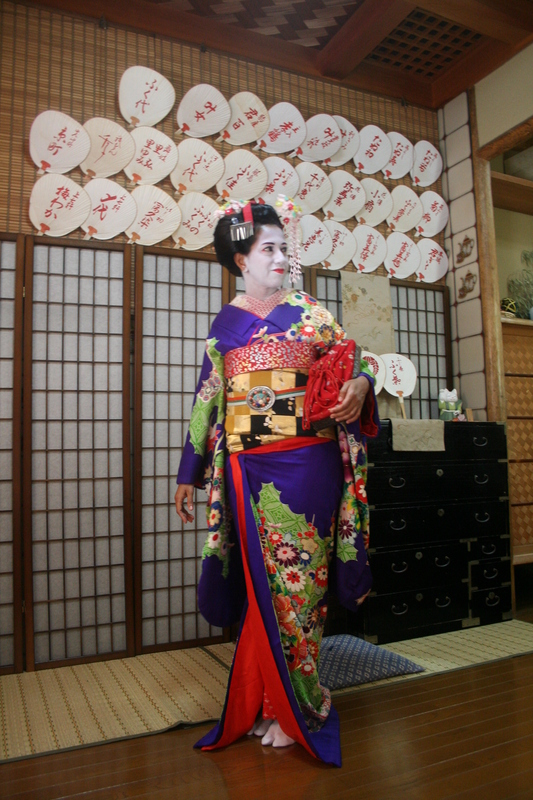 A geisha’s aesthetic is refined over years of practice. It is late evening in the geisha district of old Kyoto. Red lanterns sway in front of patchworked windows covered with rice paper. I walk down the street and knock on a nondescript door. “You are late. Come, come,” cries Midori-san. She ushers me upstairs, into a room where four women sit. Without saying a word, they take charge of me. They pull open a screen. Inside are kimonos in blue, green and grey. Spring colours, I am told. “Choose one,” says Midori-san. I am about to become a geisha: not in life but for work—on assignment. I am to be trained in etiquette and manners, dress and poise. Everything other than the last bit: I won’t receive clients. 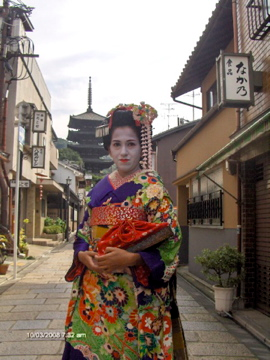 It takes a lifetime to become a geisha, not 10 days, says the agent at Michi Travel, a luxury travel company that arranged for me to be introduced to geisha training schools in Kyoto. Four women work on me. One wraps a kimono around me, nipping and tucking the garment like a plastic surgeon on steroids. Another meanwhile is tying the obi (sash) rather tightly around my middle. She waits till I exhale and pulls tighter—like Mammy in Gone With the Wind. After a point, I hold my breath in rebellion. My face turns red. My waist has never looked smaller or more shapely. My tormentor stares expressionlessly at my reflection, waiting for me to exhale. When they are done, I find that I can’t sit; only kneel. I hobble around, taking small steps. The other two women are beauticians. One paints my face white—not Fair & Lovely white; not Jolen bleach white. This is white paint applied to my face till it resembles a kabuki dancer. My lines vanish, as does any semblance of expression. The proud disdain that I feign disappears. The other woman draws black lines around my eyes and paints my lips a rosebud red. I look like a very white Mona Lisa. Nobody, not even me, can make out what I am thinking. Midori-san reappears. “Kawaii (cute),” she exclaims, spinning me around like a Kathak dancer who can’t move her legs. I feel fragile and wobbly, like I need a man to steady myself. Is this how the geisha are subdued—by simply tightening their clothes till they cannot breathe, let alone think? Now comes practice. How to walk, talk, kneel, serve tea and laugh. Midori-san wants me to draw a figure 8 when I walk. It is called “shinayakasa,” she says. It sounds like a snake. Maybe that is the reptile I should channel. I slip into the wooden high heels they have placed in front, take one step forward and promptly fall on my face. Even then, the white make-up stays in place. I am getting worried. Is it rubber cement? Or plaster of Paris? Will I lose all expression and become totally Zen? How to intimidate the taxi driver then? I roll my eyes to no effect. They can’t see it under the make-up anyway. The women hold me on all sides and make me walk up the street. “Shinayakasa, shinayakasa,” I mutter to myself, sounding like a bullet train crossed with Indian Railways. We go into a restaurant down the road into an anteroom, where tea has been laid. Midori-san makes me kneel beside the screen. Gravity battles geisha-gear as I struggle to fold my lower limbs and crouch. I end up collapsing. You would think that opening a rice-paper screen is a no-brainer: Just roll it across. My instructions are very specific: where to place the left hand, then right, how many inches apart, and how much to lean forward while doing it. It all has to do with grace and beauty. No culture has studied it more than the Japanese. 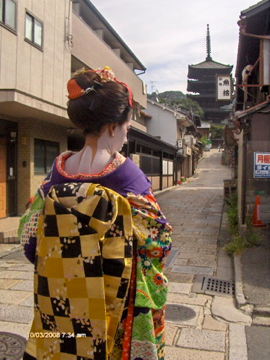 An elegant kimono-clad lady enters to begin another lesson. The idea is to make your guests feel comfortable, she says in broken English. Some instructions are easy and make sense. Geishas never wade through the middle of the room in case the conversation flow is broken. They walk near the walls. Nothing is loud or raucous. Laughter becomes giggles. “Cover your mouth with the back of your hand,” she says. “Fingers together.” She adjusts my arm, nudges my back so I kneel straighter and pushes my shoulder down. “Pay attention to posture,” she says. My lessons continue for days. By the end, I am awed by these women. Some of their behaviour will outrage feminists but if you suspend that judgement, the grace they exhibit is inspiring. A geisha sees details. Her aesthetic is trained over years to become what I call “just so”. You know those people who walk into a room and adjust a flower or cushion with one simple motion and then, suddenly, everything looks right; everything looks just so. They are the ones who could be geishas. 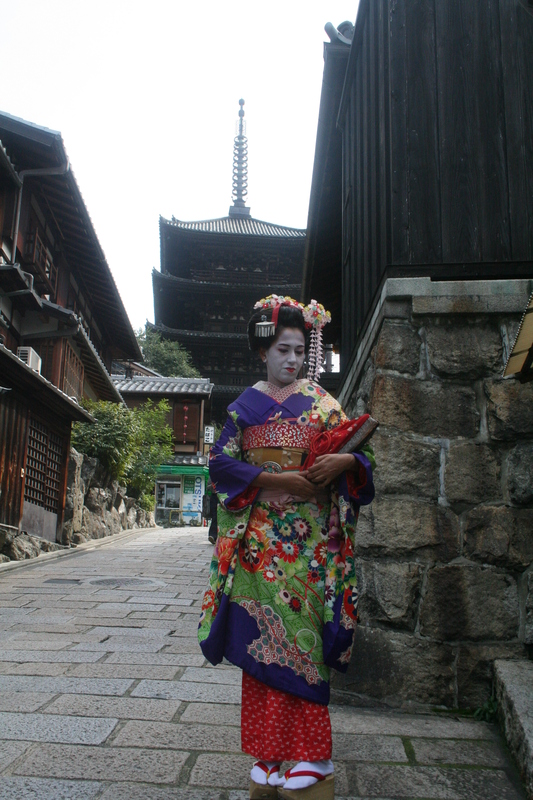 Ø Travel companies in Japan can connect you with the geisha world in Kyoto. I used Michi Travel, but there are others (a geisha experience with Michi for a week to 10 days can be tailored for $10,000, or around Rs.6.2 lakh, all inclusive. Immersing yourself in a culture through icons is a terrific way of seeing the world differently—whether it is learning t’ai chi in China or cooking pasta in Italy; or becoming a flâneur in Paris; or creating scents in Morocco. The world has many pleasures. Take a dip into it. Shoba Narayan writes the weekly column The Good Life.